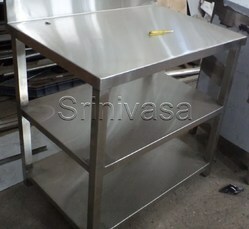 Prominent & Leading Manufacturer from Pune, we offer ss work tables. With a precise understanding of the relevant industry, we introduce ourselves as the leading manufacturer, wholesaler and supplier of SS Work Tables. Our provided work table is designed by our workforce in the highly advanced infrastructure unit using best grade material and modern techniques.